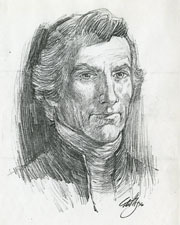 WALKER, John Williams, (father of Percy Walker and great-great-grandfather of Richard Walker Bolling), a Senator from Alabama; born in Amelia County, Va., August 12, 1783; attended a private school; graduated from The College of New Jersey (now Princeton University) in 1806; studied law; admitted to the bar in 1810 and commenced practice in Huntsville, Ala.; member, Territorial house of representatives 1817, and served as speaker; president of the State constitutional convention in 1819; upon the admission of Alabama as a State into the Union was elected as a Democratic Republican to the United States Senate and served from December 14, 1819, to December 12, 1822, when he resigned; died in Huntsville, Madison County, Ala., April 23, 1823; interment in Maple Hill Cemetery. Bailey, Hugh C. John Williams Walker: Life of the Old Southwest. University, Ala.: University of Alabama Press, 1964; Owsley, Frank L. "John Williams Walker." Alabama Review 9 (1956): 100-19.